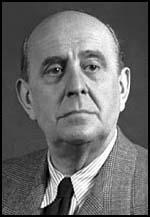 Jan Masaryk, the son of Tomas Masaryk, was born in Czechoslovakia in 1886. He became a diplomat and from 1925 to 1938 was the Czech ambassador in London. In this role he tried unsuccessfully to stop Adolf Hitler, Neville Chamberlain, Edouard Daladier and Benito Mussolini signing the Munich Agreement which transferred the Sudetenland to Germany. In 1941 Eduard Benes became head of a Czechoslovakia provisional government in London. Masaryk became foreign minister and during the Second World War was a popular radio broadcaster to the people in his homeland. Benes maintained a good relationship with Joseph Stalin and on 12th December 1943 he signed a treaty of friendship with the Soviet Union. In March 1945 Benes flew to Moscow and after meeting Stalin agreed that in his post-war coalition he would accept several Soviet-trained Czechs. Masaryk and Benes accompanied the Russian-sponsored Czechoslovak Corps that liberated the country from Nazi Germany in May 1945. Eduard Benes became president of Czechoslovakia but in the 1946 general election the Communist Party won the largest number of parliamentary seats with 38 per cent of the votes. Klement Gottwald set up a National Front government but caused great controversy when under the orders of Joseph Stalin, he rejected Marshall Aid. In June 1948, when it became clear that Gottwald intended to introduce a Russian-style political system, Benes resigned from office. Later that year Jan Masaryk was found dead. He had either been murdered or had committed suicide in protest at the imposition of a Stalinist political system. His friend, Edward Murrow, argued: "Did the course of events during the last two weeks cause Masaryk to despair and take his life, or was he murdered? This is idle speculation. Both are possible. But somehow this reporter finds it difficult to imagine him flinging himself from a third-floor window, which, as I remember and as the news agencies confirm, is no more than thirty-five or forty feet above the flagged courtyard. A gun, perhaps poison or a leap from a greater height would have been more convincing. It may be, of course, that Jan Masaryk made the only gesture for freedom that he was free to make. Whichever way it was, his name with that of his father will be one to lift the hearts of men who seek to achieve or retain liberty and justice." This reporter would attempt to say a few words about an old friend. They say he committed suicide. I don't know. Jan Masaryk was a man of great faith and great courage. Under certain circumstances he would be capable of laying down his life with a grin and a wisecrack. For more than two years he had hidden a heavy heart behind that big smile and his casual, sometimes irreverent, often caustic comment on world affairs. I knew Jan Masaryk well before, during and after the war. I say that, not in any effort to gain stature in your eyes, but rather as a necessary preface to what follows. I sat with him all night in his London embassy the night his country was sacrificed on the altar of appeasement at Munich. He knew it meant war, knew that his country and its people were doomed. But there was no bitterness in the man, nor was there resignation or defeat. We talked long of what must happen in Europe, of the young men that would die and the cities that would be smashed to rubble. But Jan Masaryk's faith was steady. As I rose to leave, the grey dawn pressed against the windows. Jan pointed to a big picture of Hitler and Mussolini that stood on the mantle and said, "Don't worry, Ed. There will be dark days, and many men will die, but there is a God, and He will not let two such men rule Europe." He had faith, and he was a patriot, and he was an excellent cook. One night during the blitz he was preparing a meal in his little apartment. A bomb came down in the middle distance and rocked the building. Jan emerged from the kitchen to remark, "Uncivilized swine, the Germans. They have ruined my souffle." I once asked him what his war aim was, and he replied, "I want to go home." He always knew that in a world where there is no security for little nations there is neither peace nor security for big nations. After the Munich betrayal, the British made a conscience loan to Czechoslovakia. Benes and Masaryk used a considerable part of the money to set up an underground news service. It was functioning when the Germans overran the country, and all during the war those two men were the best informed in London on matters having to do with Middle Europe. They had information out of Prague in a matter of hours from under the noses of the Germans. Jan Masaryk took to the radio, talking to his people, telling them that there was hope in the West, that Czechs and Slovaks would again walk that fair land as free men. When the war was over he went home. Certain that his country had to get along with the Russians or, as he used to say, "they will cat us up," his faith in democracy was in no way diminished. He became foreign minister in a coalition government. As the Communist strength increased, Jan saw less and less of his friends when he came to this country. His music gave him no comfort; no more were there those happy late night hours with Masaryk playing the piano, hours of rich, rolling Czech and Slovak folk songs. I asked him why he didn't get out, come to this country where he had so many friends. He replied, "Do you think I enjoy what I am doing? But my heart is with my people. I must do what I can. Maybe a corpse but not a refugee." Did he make a mistake in this last crisis? I do not know. He stayed with Benes. Who knows what pressures he was subjected to? It is unlikely that he could have altered the course of events. Perhaps it was in his mind that he could save some of his friends, some small part of liberty and freedom, by staying on as non-party foreign minister. I talked to him on the telephone on the third day of the crisis, before the Communists had taken over. He thought then that Benes would dissolve parliament, call a national election, and the Communist strength would decrease. It would appear that the Communists moved too fast. Did the course of events during the last two weeks cause Masaryk to despair and take his life, or was he murdered? This is idle speculation. Both are possible. But somehow this reporter finds it difficult to imagine him flinging himself from a third-floor window, which, as I remember and as the news agencies confirm, is no more than thirty-five or forty feet above the flagged courtyard. A gun, perhaps poison or a leap from a greater height would have been more convincing. It may be, of course, that Jan Masaryk made the only gesture for freedom that he was free to make. Whichever way it was, his name with that of his father will be one to lift the hearts of men who seek to achieve or retain liberty and justice.